Ropa Americana…need I say more? 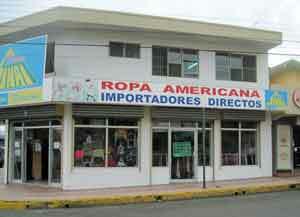 Luckily, there are Ropa Americanas located all over the country. It seems any decent sized town has one, and San Ramon has several. Ropa Americana is like a Goodwill Store in the U.S., mostly men’s, women’s, & children’s clothes, linens, purses, & stuffed animals, at cut-rate prices. Did I say it was cheap? Most items are used, but clean, and some are new. You’ve got to shop and pick through the items, but most are sorted by size. Like a Goodwill Store, there can be many surprises, and usually they’re good. You just never know what you’ll find. We’ve personally purchased a denim jacket ($4), placemats, cloth napkins, shirts ($1-2), pants (3 for $4), & sweatshirts ($2). 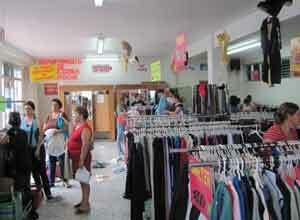 When we lived in the U.S., we rarely, if ever, shopped at Goodwill, but here it’s an adventure! So if you live in Costa Rica and haven’t tried Ropa Americana, you don’t know what you’re missing.